In the previous post, I covered the EU's latest report on real economic convergence in Central & Eastern European (CEE10) Accession states. As promised, here is a look at the last remaining core driver of this 'fabled' convergence: the financial services sector (which drove the largest contribution to growth in pre-crisis period 2004-2008 and remained significant since). 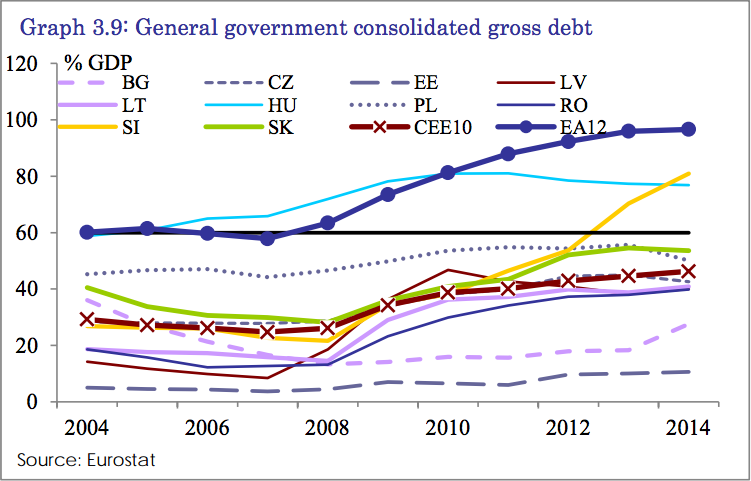 In summary: debt is the currency of CEE10 convergence. 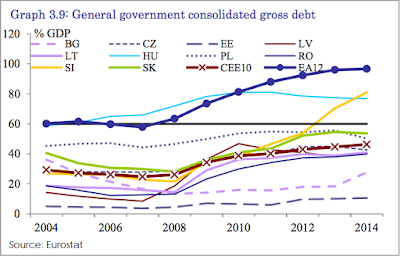 Let's start with Public Debt. 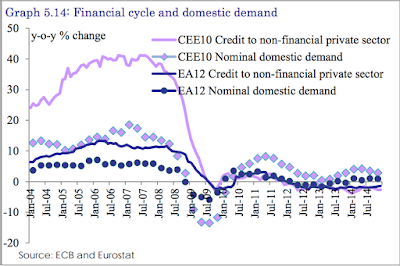 As the above shows, CEE10 debt rose during the crisis despite GDP uptick. Rate of growth in debt was slower in CEE10 than in the original euro area states (EA12), which was consistent with stronger CEE10 performance in terms of fiscal balances and lower incidence / impact of banking crises. 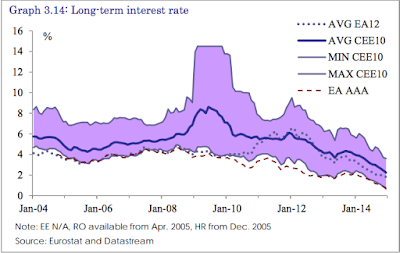 Scary bit: "The negative impact of the 2008/09 global financial crisis as well as the following euro-area sovereign debt crisis on financial conditions in the CEE10 revealed that, despite relatively lower general government debt levels (compared to the EA12 average), some CEE10 countries might still encounter problems to (re-)finance their public sector borrowing needs during periods of heightened financial market tensions as their domestic bond markets are in general smaller and less liquid". Which brings us to private sector financialisation. 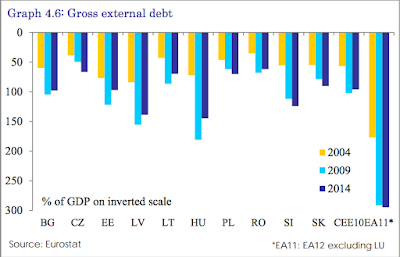 Per EU: "CEE10 countries entered the EU with relatively underdeveloped financial sectors, at least in terms of their relative size compared to the EA12. 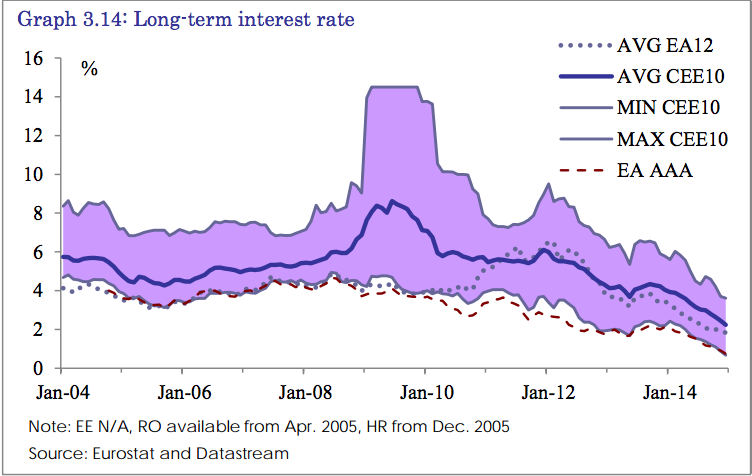 This was the case for both market-based and banking-sector-intermediated sources of funding. 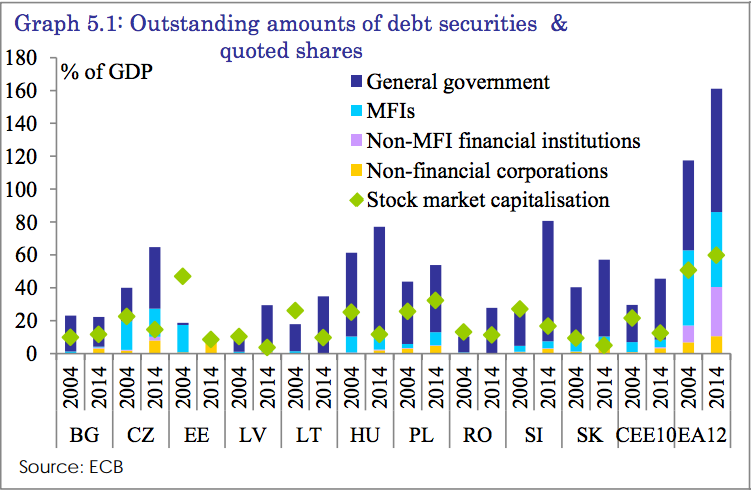 In 2004, the outstanding stocks of quoted shares and debt securities amounted on average to just about 20% and 30% of CEE10 GDP, compared to around 50% and 120% of GDP in the EA12. 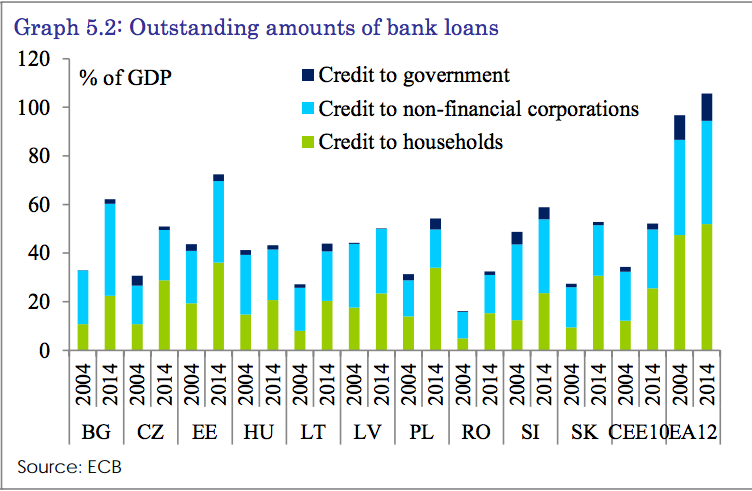 Similarly, bank lending to non-financial sectors accounted for just some 35% of CEE10 GDP whereas it reached almost 100% of GDP in the EA12." It is worth, thus, noting that equity and direct debt financialisation relative to bank debt financialisation, at the start of 'convergence' was healthier in the CEE10 than in the euro area EA12. Predictably, this changed. 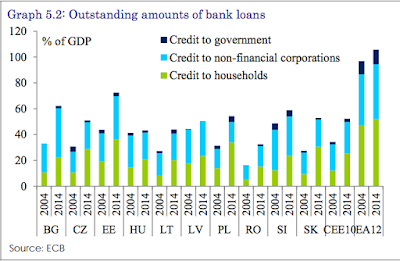 "As the government sector accounted for the majority of debt security issuance in the CEE10, bank credit represented the main external funding source for the non-financial private sector." foreign ownership as well as high levels of concentration. 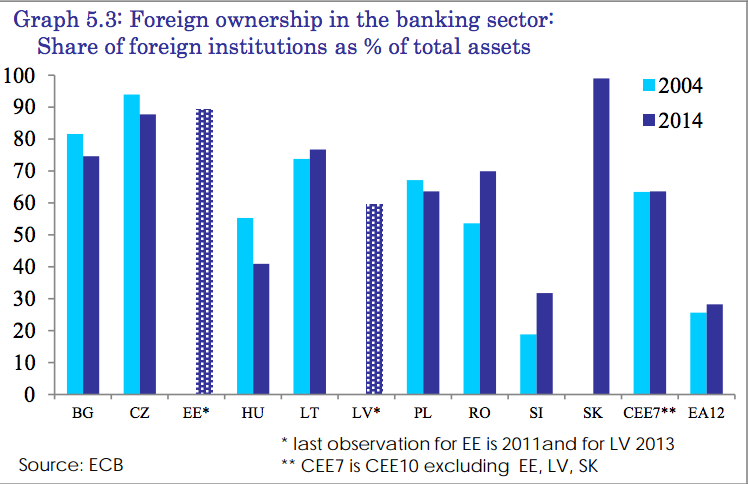 The share of foreign-owned banks and the market share of the five largest banks (CR5) in CEE10 countries remained relatively stable over the last 10 years, on average exceeding 60%. 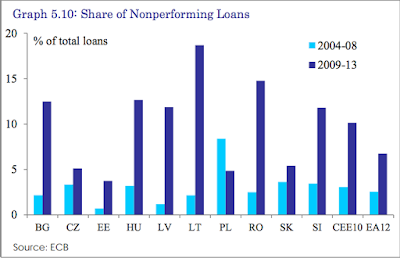 There was however some cross-country divergence as Slovenia stood out with a relatively low share of foreign-owned banks, which only increased to above 30% in 2013. At the same time, the Estonian and Lithuanian banking sectors exhibited the highest levels of concentration, with their respective CR5 averaging 94% and 82% over 2004-14. 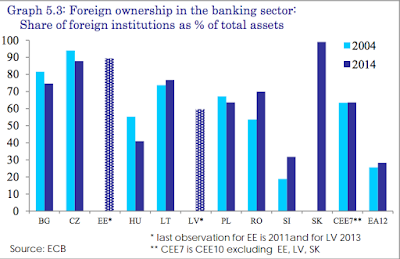 On the other hand, the role played by foreign-owned banks is rather limited in most EA12 countries while their banking sectors are in general also somewhat less concentrated, with their CR5 averaging around 55% over the last 10 years." 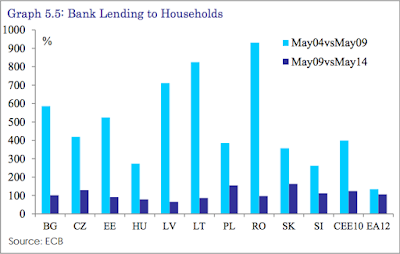 Which, basically, means that the lending boom pre-crisis is accounted for, substantially, by the carry trades via foreign banks: the EA12 banks had another property & construction boom of their own in CEE10 as they did in the likes of Ireland and Spain. 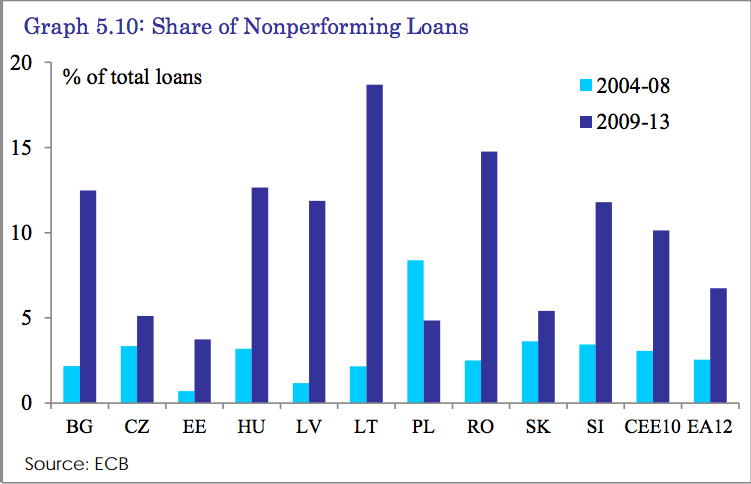 Shares of Non-Performing Loans rose quite dramatically, exceeding the already significant rate of growth in these in EA12 across 6 out of 10 CEE10 states. 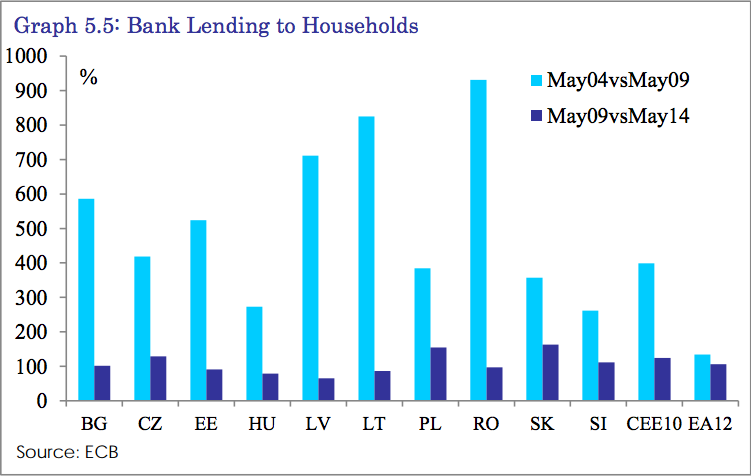 In summary, therefore, a large share of 'real convergence' in the CEE10 economies over 2004-2014 period can be explained by increased financialisation of their economies, especially via bank lending channel. 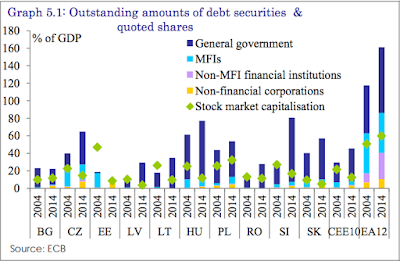 As the result, much of pre-crisis convergence is directly linked to unsustainable boom cycle in investment (including construction) funded by a combination of bank debt (carry trades from Euro area and Swiss Franc) plus EU subsidies. These sources of growth are currently suppressed by long-term issues, such as high NPLs and structural rebalancing in the banking sector.